John Winston Ono Lennon (9 October 1940 – 8 December 1980) is one of the most celebrated English singers, songwriters and composers of the 20th century, He co-founded the Beatles, the most commercially successful band in the history of popular music. He and fellow member Paul McCartney formed a much-celebrated lucrative songwriting partnership. Along with George Harrison and Ringo Starr, the group would ascend to worldwide fame during the 1960s. However, his fame outdid the Beatles and he is remembered now as a pioneer, as a figure who fought for world peace and did his best to persuade the American political leadership to give up the involvement in the Vietnam War. He was born as John Winston Lennon in Liverpool. His fun-loving working-class parents married briefly and late and declined to raise their quick, sensitive, gifted son. Separated traumatically from each of them by age five, he was raised strictly by his maternal aunt,Mimi Smith, whose husband died during Lennon’s adolescence, as did his biological mother, who had taught him to play the banjo. Lennon excelled at art and music while attending high school, but his grades were poor and he had trouble spelling. He was rowdy in the classroom and was called a troublemaker Some teachers noticed his difficulties with school and would encourage Lennon to express himself. Such circumstances were not uncommon in the wake of World War II, but in Lennon they generated anger that he sublimated with brilliance and difficulty and an intense need for human connection. Thus, Lennon let his talent shine through his music and writing. In 1957, he formed his first band,the Quarrymen, which would eventually become the world famous Beatles. The Beatles were essentially a joint venture between practical pop adept Paul McCartney and alienated rock-and-roll rebel Lennon, but, as a disruptive cultural force, they always bore Lennon’s stamp .In the Beatles, the alliance of John Lennon and Paul McCartney produced some of music's greatest songs. Lennon began to record as a solo artist before the band's break-up His first solo release, 1969's "Give Peace A Chance" was recorded with his wife Yoko Ono while he was still in the Beatles and garnered worldwide attention and commercial success. in April 1970; another popular song "Instant Karma!" 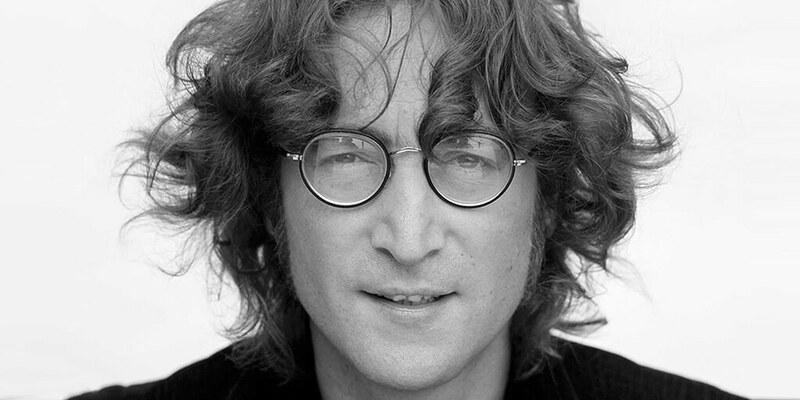 Lennon subsequently produced albums that included John Lennon/Plastic Ono Band and Imagine, and songs such as "Working Class Hero", "Imagine" and "Happy Xmas (War Is Over)". He had his first No. 1 solo hit with 1973's "Whatever Gets You Through The Night,"
With the birth of his second son , Lennon took on the role of househusband, beginning what would be a five-year hiatus from the music industry during which he gave all his attention to his family. Lennon emerged from retirement in October 1980 with the single "(Just Like) Starting Over", followed the next month by the album Double Fantasy, which contained songs written during a journey to Bermuda on a 43-foot sailing boat the previous June, that reflected his fulfilment in his new-found stable family life. On 8 December 1980, as Lennon and Ono returned to their New York apartment in the Dakota, Mark David Chapman shot Lennon in the back four times in the archway of the building. Lennon was taken to the emergency room of nearby Roosevelt Hospital and was pronounced dead on arrival. Earlier that evening, Lennon had autographed a copy of Double Fantasy for Chapman. Lennon’s pronouncements, both cynical and idealistic, reveal a sincere and original thinker. Lennon revealed a rebellious nature and acerbic wit in his music, writing, drawings, on film and in interviews. Some of his songs were adopted as anthems by the anti-war movement and the larger counterculture. One of the key concepts in Lennon’s thought is that every individual represents a singularity of potential, each of whom is capable of influencing others, and the ripple effect can change society. He asserts that the cosmic laws of balance and retribution also apply in our current lives. We therefore need to be mindful of our actions and attitudes and their consequences. Most of all, he proved that musicians could successfully reinvent and transform themselves, and carve out success on their own terms. He never lacked optimism that we would get there if we kept our dream in focus. As a philosopher he kept encouraging us to gaze at the horizon; as an artist he felt free to vent his frustration about our constant myopia. Lennon earned his first career GRAMMYs for Best New Artist and Best Performance By A Vocal Group for Hard Day's Night as a member of the Beatles. He earned posthumously his only solo GRAMMY for Album Of The Year for Double Fantasy, which was released just weeks before his death in 1980. Born in 1940 and taken away from us so tragically in December 1980, we will never know what else John would have offered as he left his 40th year, but his discography pays testimony to his talent John Lennon composed some of the most compelling music of his career with striking and diverse songs that would go on to influence generations of songwriters. 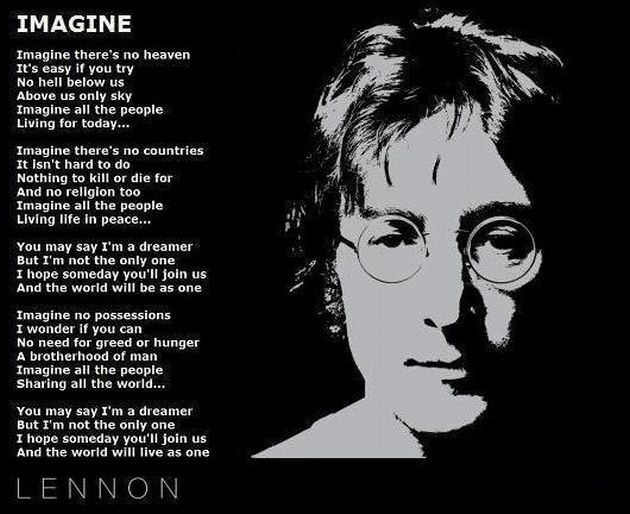 The plain lyrics hides the powerful message behind it, Imagine takes on three of the most divisive issues of humankind – religion, nationalism and possessiveness Amid the ferment of anti-war protests, Lennon envisaged a world without borders, where there would be "Nothing to kill or die for/And no religion too and gently invites us to look at them from a neutral perspective and to consider the possibility that the whole of humanity would live unattached to material possessions. He challenges the acceptance of war by countries and religion again: “Imagine there's no countries...no religion too”..How many wars have been fought in the name of patriotism, sovereignty, imperialism and territory? . We take pride in saying “we are willing to die for our country”. True, there’s nobility in that, because we are already divided into territories. But what if there were no territories? Would people still have to die for a piece of land? Probably not!What if the whole world was one nation? Would people still fight for boundaries? Wealthy and powerful nations thrive on acquiring and pondering smaller and weaker nations. ‘Peace’ is the shield they use to cover their dirty hands..
His last challenge is to greed and consumerism: ""Imagine no possessions..."".Lennon touches on materialism over humanity People, lost in selfishness and greed, forget the importance of sharing and caring for each other. ‘Love thy Neighbor’ is a saying that is lost on most people due to the materialistic attitude which is caused by the capitalistic society that we live in today. When no one owns anything, then there is no room for greed and selfishness. He realized that the softer approach would bring the song to a wider audience, who hopefully would listen to his message that we should keep on optimistic to the peace and create the world as a better place to live. But one thing is certain that john and Yoko's provocative anthem became a hymn for peace.